TLS 1.2 requirements work both ways - outgoing and incoming. 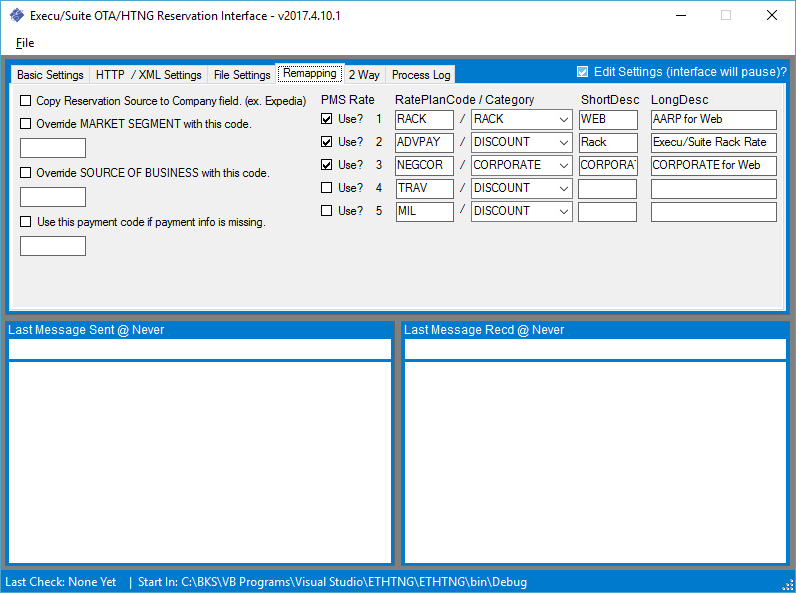 Customers with an OTA / HTNG Reservation Interface (CRS Vendors like Travelclick, Synxis, Vertical Booking. etc.) are running IIS on one of their computers. TLS 1.2 will soon be required for incoming connections from your CRS vendor on this computer. You must check with the appropriate vendor to determine the TLS cutoff date for reservation delivery to your server. If you are a Cloud Hosted customer there is nothing you need to do because we take care of this. This is different than the TLS 1.2 requirements for credit card processing because those requirements only affect outgoing connections. The requirements discussed here are for incoming connections into your computer that's running IIS. Meeting this requirement is simple but may require your IT professional's assistance. Ensure that the computer hosting IIS and our OTA / HTNG Reservation Interface web service is running at least Windows 7 or Windows 2008R2. Import these Registry settings. After you extract the file you can view the .reg file in Notepad to see what it does. This only addresses incoming connections to the server. Information about these registry settings can be found here. Here is more information regarding Server 2008R2 and presumably Windows 7. 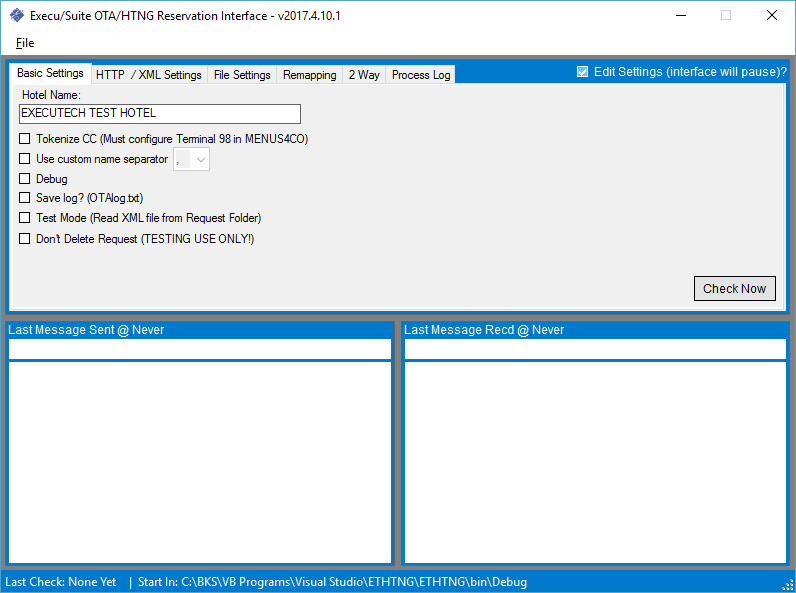 This is an ASP.NET web service that receives the messages sent from the CRS. The customer must be sure to install IIS with the ASP.NET role. Otherwise, IIS won't recognize the service and may return a "404" error. This is an application that runs as a scheduled task and processes the information received from the CRS. Microsoft .NET Framework 4.0 required. 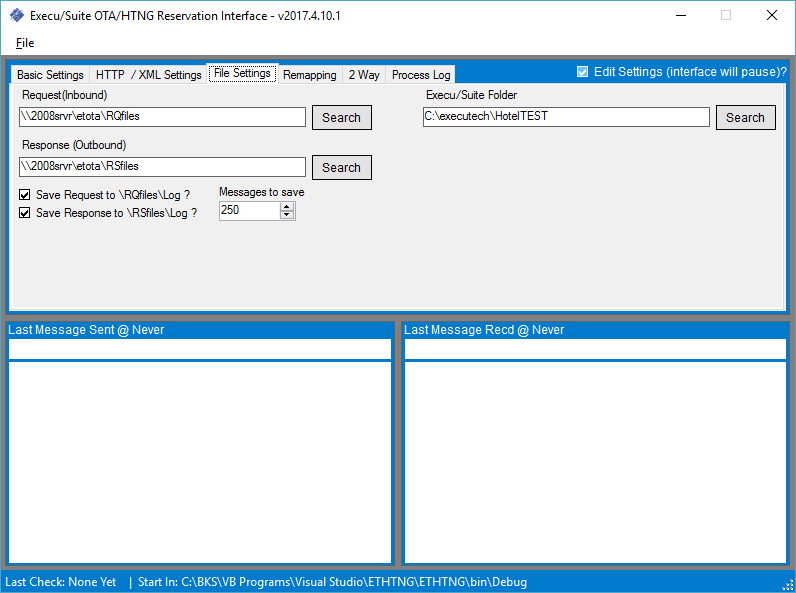 (ETHTNG-Sender.exe) This is an application that runs as a scheduled task and sends responses to the messages received from the CRS and also sends the 2 way messages. This folder contains the Processor and Sender, as well as the folders that contain log files and XML templates. Extract the contents of this folder into the PMS software folder. This folder contains the Web Service files. Extract the contents of this folder into the folder created for the Web Service. Installation should only be performed with the assistance of Execu/Tech support staff. DO NOT use this to update an existing install of the interface. 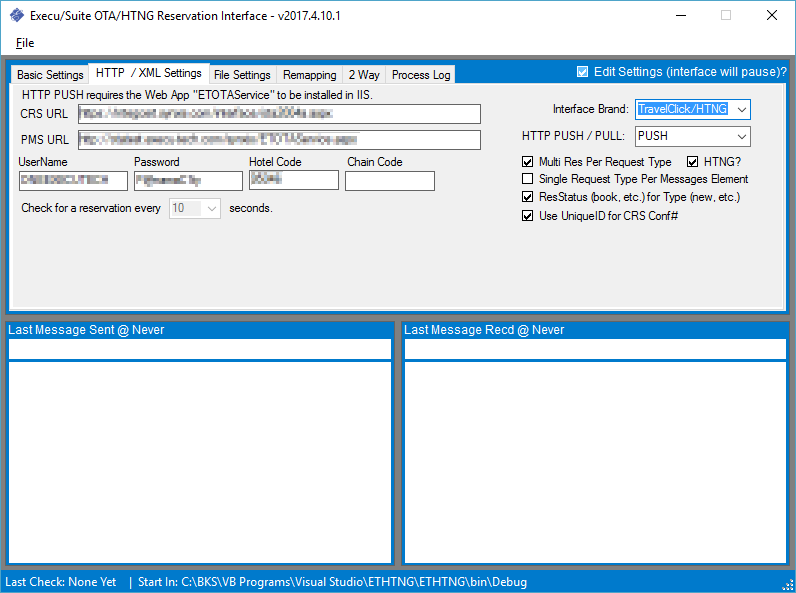 ETOTAService.aspx - The Web Service application. ETOTAService.inc - The Web Service settings. 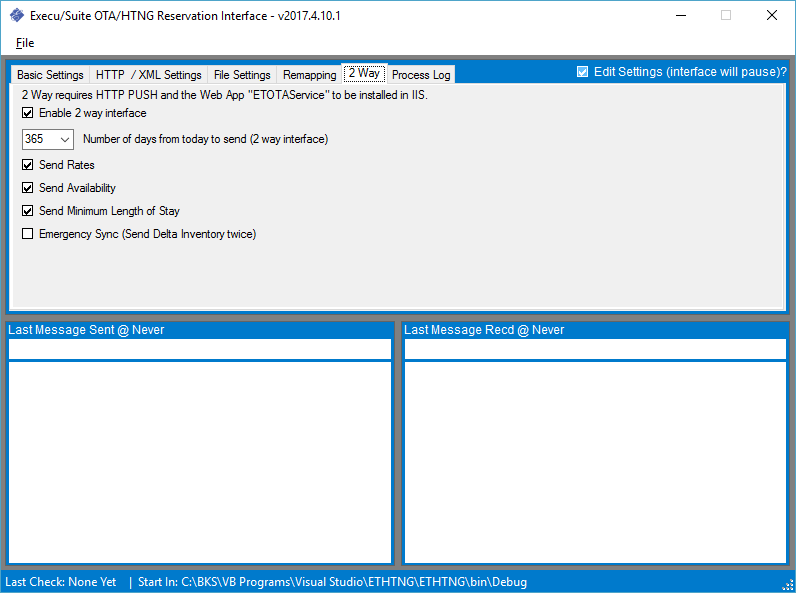 IIS is required for the two way interface. The customer or their IT professional is responsible for the following. Installing IIS (Microsoft's Internet Information Services) on the PMS server. firewalls and routers to ensure that the public IP address is properly directed to the PMS server. All communications are encrypted on port 443, the default SSL port. If you have a 2 way interface (Rates, Availability, etc. are updated from the PMS to the CRS) then your router / firewall will need to allow outgoing traffic to the CRS URL on port 443. The CRS can give you the URL. Obtaining and configuring a domain name if it's required by the CRS vendor. This is part of the URL that the CRS will use to post reservation information to your server. Often a domain with a unique subdomain (in this example it's the part before mydomain.com) like crs.mydomain.com or reservations.mydomain.com is used, but this is up to you. It is likely required if you already have a website that uses the same domain name but is hosted on another server. Obtaining and installing an SSL certificate on the PMS server. This certificate must be generated for the full domain including the subdomain or it must be a wildcard. Your IT professional will help you with this. We will need the domain name before we can provide the CRS with the PMS URL necessary for the 2 way interface. The Web Service is installed into a folder provided by the customer, similar to WebRes. If they have WebRes, it shouldn't be a problem installing it in a sub folder inside their WebRes folder. If they don't have WebRes, these are the basics they will need to know to provide you with a folder. Items 1 - 4 should be completed by the customer's IT professional. If they have any questions, they should contact Execu/Tech Support before proceeding. Install IIS with the ASP.NET role. Otherwise, IIS won't recognize the service and may return a "404" error. They must have a SSL certificate, but they can get this after the install. Provide Execu/Tech with the folder assiciated with this site. Provide Execu/Tech with the domain for this site. Execu/Tech will typically perform the rest of these steps. Place the two files in the folder provided by the customer. It is best to create sub folders, just to make it more obvious to anyone looking at the folders and also to separate different brands of interfaces on the same computer, should that ever happen. An example of this folder structure is "inetpub\wwwroot\ETOTAService\". In this example, it's installed in its own folder in the 'default' site. WebRes can also reside in this folder, which is why you create the sub folders "\ETOTAService\". Once the customer has provided the URL to the folder they created, you can give them the URL to the web service. This URL must be provided to the CRS. In the example, if the URL was "HTTPS://ota.customer.com" then the url for the interface would be "HTTPS://ota.customer.com/ETOTAService/ETOTAService.aspx"
The IIS App Pool user (Local machine, not the domain) or IIS_IUSRS group must have full permissions to the "RQFiles" folder. The settings file "ETOTAService.inc" must be edited. You can edit it in Notepad or any other text editor. Be careful not to mess up the "<%" and "%>" at the beginning and end of the file. <br /> You may have to grant your Windows user full permissions to this folder to edit. RequestFolder - This is the path to the "RQFiles" folder from the Web Service computer. ResponseFolder - This is the path to the "RSFiles" folder from the Web Service computer. This application reads the XML message from the CRS, processes any new, modified or cancelled reservations, and generates a response if needed. There is one executable and two folders and several sub folders. It's ok for these files to be installed in the HOTEL folder as long as the computer running IIS has permissions to access the "RQFiles" and "RSFiles" folders. Copy the contents of the "To Hotel Folder" folder into the Hotel folder. Run" ETHTNG.EXE" and fill in the settings. You might get an error the first time you run the application because the settings file doesn't exist. Items in RED are provided by the CRS. This is the hotel's name. Dubug Check this to see popup messages to assist in debugging a problem. This should only be used when debugging problems. Save log? Check this to save an additional log of the back and forth communication with the CRS. Test Mode Check this to read the incoming XML from a file. Don't Delete Request Check this to leave the previous XML request. This allows you to quickly retry the same request over and over. This is the URL to the CRS Web Service. This is the URL to the PMS Web Service. Not required with a "Pull" interface. Username This is the interface username. Password This is the interface password. Hotel Property Code This is the Hotel's property code with the CRS. Chain Code This is the hotel's "Chain Code" that is assigned by the CRS. Rarely used. Interface Type This is the brand of the interface. HTTP PUSH / PULL Whether the CRS "pushes" reservations to us or we "pull" them from the CRS. "Push" means that they CRS uses our Web Service to send messages to us. "Pull" means that we use their Web Service to request messages. Multi Res Checked if the CRS sends more than one reservation in a message. HTNG Checked if the CRS uses the HTNG specs. 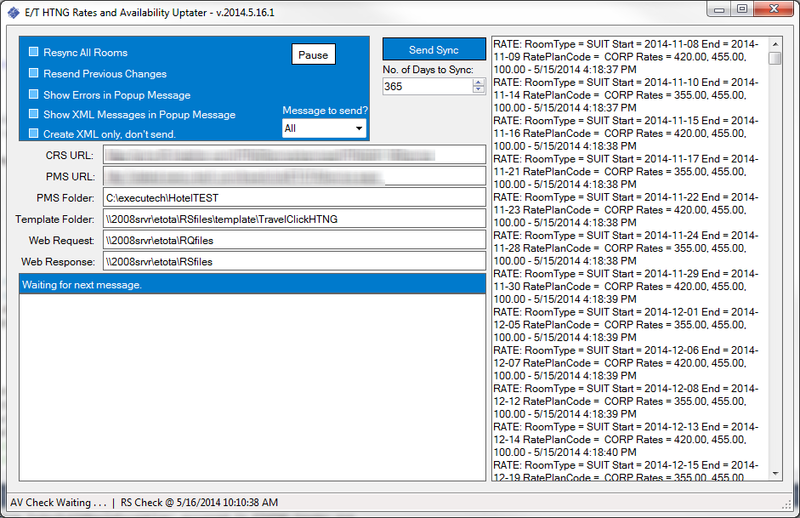 Single Request Checked if the CRS sends more than one message type (New, Modified, Cancelled) in a message. Check for a Reservation This is the interval, in seconds, that the "Pull" interface will check for changes. Some CRS companies have preferred intervals. Request (Inbound) This is the path to the "RQFiles" folder. Response (Outbound) This is the path to the "RSFiles" folder. Execu/Suite Folder This is the path to the HOTEL folder. Save Requests Checked only when testing and you need to save a copy of the XML message from the CRS. Copy Reservation Source Checked if you want the reservation source (Expedia, etc) placed in the Company field. Override Market Segment Checked if you want to override the CRS Market Segment code with the specified code. Override Source of Business Checked if you want to override the CRS Source of Business code with the specified code. PMS Rate Use? Checked if you want to use the specified rate code with the interface. YOU MUST USE AT LEAST 1 RATE. The interface will only update a single RatePlanCode for each PMS Rate Code. For example, PMS Rate Code 2 can update the CRS RatePlanCode "RACK" but not both "RACK" and "AARP". Ask your CRS vendor about linked rates. These linked rates might be 10% lower or $5.00 less than the master rate that the PMS updates. By using linked rates, the PMS can update the CRS RatePlanCode "RACK" with PMS rate code 2, which will cause all of the CRS RatePlanCodes that are linked to "RACK" to be updated as well. *In all cases, regardless of the rate or rate code, we will post the dollar amount provided by the CRS. This ensures that the guest will always be charged the rate they agreed to when booking even if there is a miss-match in the PMS. RatePlanCode This is the Rate Plan Code in the CRS. ShortDesc 2 way only. This is the Short Description of the rate plan. LongDesc 2 way only. This is the Long Description of the rate plan. Enable 2 way interface Checked if the 2 way interface is used. Number of days This is the number of days of data that the CRS will accept. Typically 180 or 365, but ask the CRS vendor. Send Rates Checked if the 2 way interface will send rates. Send Availability Checked if the 2 way interface will send availability. Send Minimum Length of Stay Checked if the 2 way interface will send minimum length of stay. Save the settings and create a Scheduled Task that runs on startup. Use the System user unless the PMS folder or RQFiles and RSFiles foders are on other computers. In that case, the customer will need to provide a user with permissions to these folders. This application is only used with the 2 way interface. It sends responses to messages from the CRS and also sends the 2 way messages (Rates, Availability and Minimum Length of Stay) to the CRS. Create a Scheduled Task. Use the System user unless the PMS folder or RQFiles and RSFiles foders are on other computers. In that case, the customer will need to provide a user with permissions to these folders. Every setting you see is for testing purposes. Don't change them. Test the URL of the Execu/Suite Web Service if it was installed. You should get this response "OTA / HTNG message expected. Nothing received - OTA/HTNG Interface - Execu/Tech Systems - www.execu-tech.com - 850.747.0581"
Make sure the Scheduled Tasks are running.